Happy Monday everyone! I hope you all had a wonderful Easter with your families and friends. Today's project is a cool gift card holder - the pattern came from a recent swap I was in and I cased it from Natalie Travis' cute card. Because of the rules of that swap, I can't post a picture yet of her card, so I decided to make a completely different design using her pattern. Start with a 4 1/4" x 11 piece of cardstock (here Soft Sky) and score it at 3" from each end, then score at 5 1/2". Fold the cardstock into the shape of a 'W'. 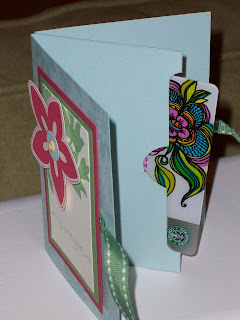 For this holder, I used the It's Beautiful Jumbo wheel to decorate the front and back covers, stamping Soft Sky ink on the cardstock. I then used Sticky Strip and attached the bottom points of the 'W' together, so it looks like a little book with one page in the middle. The ribbon closure is 16" of Wild Wasabi Double Stitched ribbon tied around the folder in a bow. I used a bit of snail on the backside to hold it in place. The front decoration was stamped using Stitched Exotics and Short and Sweet. 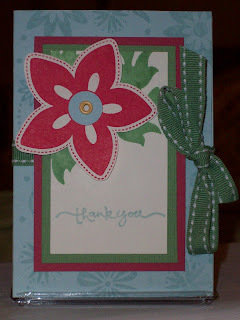 I used Rose Red ink for the flower and the eyelet is from Fresh Favorites I and attached using the Crop-A-Dile. I popped the flower up on dimensionals above some leaves stamped in Wild Wasabi. The layered front piece is attached with Snail adhesive. If you are coming to Stamp Camp tomorrow, you will get to make this beauty along with four other projects! Enjoy!